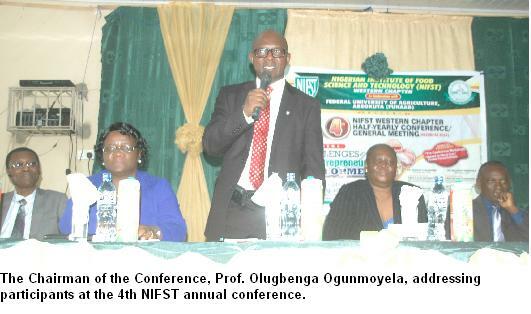 Members of the Nigerian Institute of Food Science and Technologist (NIFST), Western Chapter recently held their 4th Yearly Conference/General Meeting at the Federal University of Agriculture, Abeokuta (FUNAAB), with the theme, Challenges of Food Entrepreneurial Development. Delivering a Keynote Address at the occasion, the Dean, College of Food Science and Human Ecology (COLFHEC), Prof. Folake Henshaw who spoke on “Food Entrepreneurial Development in Nigeria: Challenges and Opportunities”, defined entrepreneurship as “the process through which entrepreneurs create and grow enterprises to provide new services or product or add value to services or product”, while noting that the harsh business environment existing in the country had made the success rate in the making good entrepreneurs very low in Nigeria. Prof. (Mrs.) Henshaw summarized the challenges facing a potential entrepreneur to include limited market, infrastructure, support services, finance, information and technology, as she proffers a way out through the introduction of entrepreneurship education in secondary/vocational training, promotion of mindset of value creation and innovation, improved skills in business planning and management as well as strengthening public/private partnerships for centres of entrepreneurship. The second Keynote Speaker, Mr. Ronald Olawale, a former President of NIFST and the Chief Executive Officer, FEEDME Ventures, Ogun State, identified environmental factors such as infrastructural challenges, bad roads and erratic electricity among others, as some of the challenges militating against entrepreneurship in the nation. He noted that there were significant entrepreneurial opportunities in the food sector of the economy and suggested that a prospective entrepreneur should have a good business ideas supported by a well-researched feasibility report, have adequate working capital and develop the proper marketing strategies. The Vice-Chancellor of FUNAAB, Prof. Olusola Oyewole, who was represented at the occasion by Dr. Ibiyemi Olayiwola of the Nutrition and Dietetics Department, challenged food scientists to embrace the requisite knowledge that would make them outstanding entrepreneurs in the areas of managerial, relationship and communication skills. The Commissioner for Commerce and Industry, Ogun State, Otunba Bimbo Ashiru, tasked food technologists not to rest on their oars in promoting the transformation of the agricultural sector in Nigeria. He added that funding was a major challenge facing entrepreneurs in Ogun State and the nation at large, while reiterating the state government’s efforts at making Small and Medium Scale Enterprises (SMEs) work in the state. The Regional Chapter Chairperson, Mrs. Lola Ajala, stated that the survival of any nation depended on food security, education of its people, and the prevailing business environment, among others. Mrs. Ajala said an entrepreneur serves as a factor of production that puts together all the variables for the creation of goods and services for the benefit of mankind. Earlier, the Chairperson, Local Organising Committee of the conference, Dr. Ganiyat Olatunde, noted that the objectives of the conference were to foster networking/collaboration among participants and to facilitate the transfer of novel and innovative concepts to the food industry for enhanced productivity. The programme was graced by eminent scholars such as: Prof. Olufemi Bamiro, former Vice-Chancellor, University of Ibadan; Prof. Isaac Adeyemi, Vice-Chancellor, Bells University of Science and Technology, Ota; Prof. Olugbenga Ogunmoyela, Dean, Faculty of Food Science, Bells University of Science and Technology, Ota and Chairman of the Conference. Others include Prof. Lateef Sanni, incumbent President of NIFST; Prof. Femi Onifade, Director, Centre for Entrepreneurial Studies (CENTS), FUNAAB; Prof. Charles Aworh, Fellow, NIFST/Academy of International Food Science and Technology and scientists from the various institutions of higher learning across the South-West.